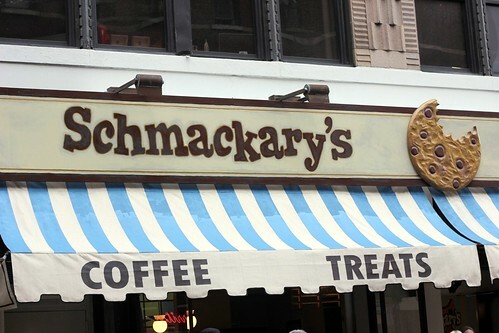 You know that I had to stop working on the book and trek across town to try out the new bakery Schmackary’s (45th btw 8th+9th) after reading Rachel’s report. Even if it is slightly out of bounds–it is in an area that doesn’t have many bakery options and I was hearing very good things. I stopped by for my lunch, picking up two treats ($5) and a latte ($3.35). Since I judge bakeries on their classic chocolate chip cookie, I picked up theirs along with their peanut butter cup. It was a home run on both accounts. 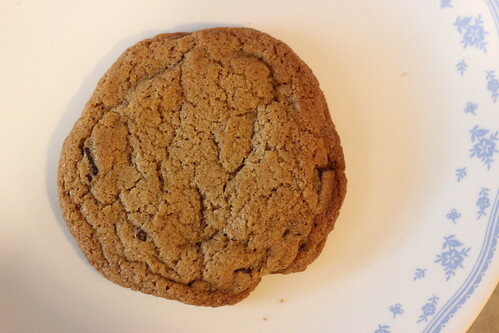 The classic chocolate chip was one of their bigger cookies–they also have smaller sized ones. 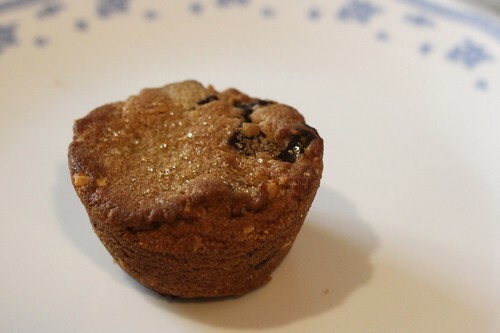 It’s deliciously chewy throughout, even on the edges, with a fair amount of chocolate chips. It was a pretty great cookie and will be phenomenal when they begin doing ice cream sandwiches. The peanut butter cup was a little deceiving to me. I thought that once I bit in, there would be a surprise treat of a baked-in peanut butter cup. Admittedly I was a bit overwhelmed gazing at all of the options that I didn’t read any of the descriptions. Instead, it’s a crumbly peanut butter cake with a few chocolate chunks. Still delightful and a treat for pb-lovers like myself. And though it seemed small, it was quite enjoyable. The lady at the counter told me that they hope to have milkshakes and ice cream sandwiches within the next few weeks, most likely making the ice cream in-house. Posted by Blondie at 1:45 pm, June 5th, 2012 under Schmackary's. “Most likely” making the ice cream in house doesn’t sound too promising. Bring on the ice cream cookie sandwiches!! I tried the bacon and maple cookie last week. Excellent. I was sorry to see Piece of Chicken go under, but at least something good opened in its place.